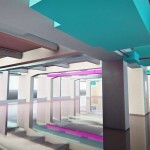 BIM Models can be leveraged not just in the office but also on the field. Data from the model including layout information and geometry can be pushed to robotic total stations and devices on site to maximize the accuracy during the execution phase. There are variations from the design in every kind of project because of the nature of construction sites. These changes need to be effectively documented so as to enable sanctity of data for O&M. Techture deploys teams on site to track this information and bring the model to the as-built stage. When there is a team on site using BIM, there are many aspects of construction that can be optimized. Pour wise quantities of concrete, bar bending schedules, procurement costs management and a lot of other benefits can be leveraged through BIM Management. 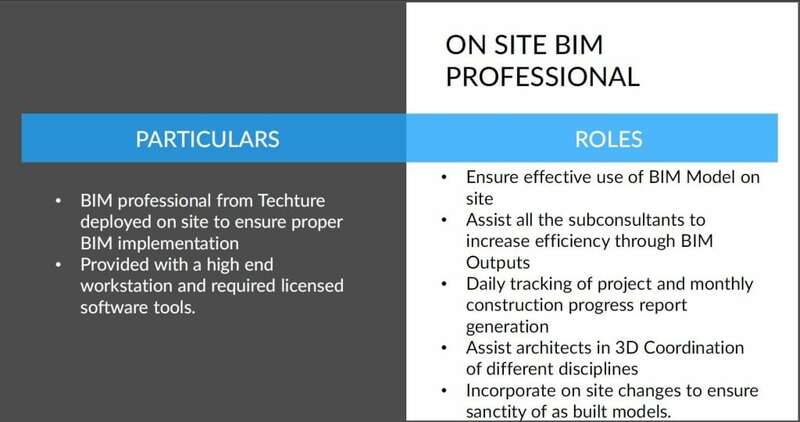 When there is a team on site using BIM, there are many aspects of construction that can be optimized. Pour wise quantities of concrete, bar bending schedules, procurement costs management and a lot of other benefits can be leveraged. The new emergent truth in the construction business seems to be the acceptance of BIM as a wonderful all-rounder technology. There is no contest against that fact. However, the crucial question still remains the same: Have we truly, and in every sense, adopted BIM? The answer to this is rather discouraging. The effort taken by teams of architects, civil engineers, MEP professionals and other such stakeholders is often diluted by poor implementation of BIM on the site. Communication is essential to an integrated site management process. In absence of tools that simplify communication on the site, it is difficult to keep all the players in the loop and extract the highest essence of the technology endowed in form of BIM. Many clashes are detected when contractors and workers start their on-ground work. Due to the lack of proper on-site communication, the project runs into delays and cost overruns become common. A collaborative communication seems to be the only solution. Any change in the design proposed by one player, for example, the architect, leads to corresponding changes in other design models too. A single model for the entire project encompassing different players is hardly ever possible. A structural engineer may have his analysis model, a contractor may have his construction simulation model, and a fabricator may have his shop drawings and likewise for other contributors: the key to successful implementation is interoperability. Though different stakeholders have their own different models, this does not mean the models in themselves are separate and unconnected. In fact, these different models highly move in tandem. A change in one aspect by one stakeholder is capable of changing the design in each of the other stakeholders too. Thus, a constant revision of the current model is necessary to ensure that each model represents the same building which attained through proper BIM Management. 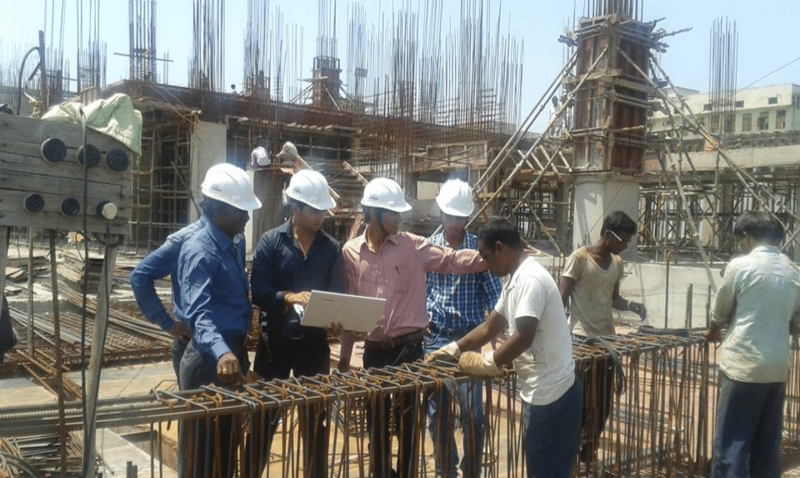 A collaborative communication seems to be the only solution which is backed by BIM Management. Any change in the design proposed by one player, for example, the architect, leads to corresponding changes in other design models too. A single model for the entire project encompassing different players is hardly ever possible. A structural engineer may have his analysis model, a contractor may have his construction simulation model, and a fabricator may have his shop drawings and likewise for other contributors: the key to successful implementation is interoperability. Though different stakeholders have their own different models, this does not mean the models in themselves are separate and unconnected. In fact, these different models highly move in tandem. A change in one aspect by one stakeholder is capable of changing the design in each of the other stakeholders too. Thus, a constant revision of the current model is necessary to ensure that each model represents the same building. The new emergent truth in the construction business seems to be the acceptance of BIM as a wonderful all-rounder technology. There is no contest against that fact. However, the crucial question still remains the same: Have we truly, and in every sense, adopted BIM? The answer to this is rather discouraging. The effort taken by teams of architects, civil engineers, MEP professionals and other such stakeholders is often diluted by poor implementation of BIM on the site.